All incoming email arrives in the user’s Inbox, and copies of outgoing messages are saved in the Sent Items folder. Therefore, all users automatically use at least two email folders i.e. Inbox, and Sent Items. Some users are reluctant to use more folders than just those two folders, and choose to have emails from all of their client matters mixed in with each other in those two folders rather than sorting emails into dedicated client matter email folders. The decision to not use dedicated client matter email folders is sometimes an informed choice and although some effort is required to file emails into folders most users who have given using email folders a fair try agree that the benefits of shared folders make using them well worth it. The following describes a process for setting up dedicated client matter email folders, identifies the benefits of using such folders, and discusses concerns users new to such system sometimes express about using such folders. Once the folders “1 – Active files” and “2 – Closed files” are created you can right click on those folders to make subfolders for specific client file matters e.g. “Armstrong”, “Butler”, “Dunbar”, etc. in the list of active files in the screenshot above. It is recommended to use the client name, a dash, and then the file number as the folder name. Since most users always have Outlook open when at work, this provides a readily accessible alphabetical list of active files so that file numbers can be easily looked up for typing into timekeeping software etc. If you are just starting out using email folders and already have lots of emails in your Inbox / Sent items then you will have to move emails relating to each active client matter into the appropriate folder under “1 – Active files”. Search is the best way to do this: identify the email addresses that would be unique to the client matter, do searches for those email addresses and then move all of those emails to the appropriate newly created client matter email folder. 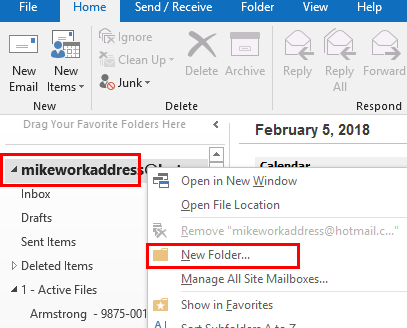 (Tip: using an “All Mail” Search Folders will allow such searches to be done most efficiently – see the guide on Search Folders). As new files are opened client matter subfolders should be created under “1 – Active files”, and as files are closed the client matter email folders should be moved to “2 – Closed files”. This will ensure the list of active files in Outlook is not unnecessarily long and tedious to browse. Browse to, and then click, “2 – Closed files” from the list, and then click “OK”. If all emails for a particular client matter are saved in one folder then one can review the email activity on the file for a particular time period by simply browsing that folder. This allows quick access to messages recently sent (they will be at the top of the folder), and is helpful when trying to find messages sent a long time ago when one cannot remember exactly when they were sent i.e. there are far fewer messages to browse through in one client folder as compared to a massive inbox containing messages on number client matters. The emails in the client matter folder can be sorted by date, sender, recipient etc. to help locate particular emails. Searches can be done within the client matter email folder which will generally yield more precise results than a search done using the same terms in the entire Inbox or email account. The client matter email folder can be “shared” with other users on the network so that those other users can view, and add to, the same email folder if they are also working on the file. See separate guide on shared email folders. All of the messages related to the client file can be easily saved to a pst file (if one wishes to provide a third party with an electronic copy of all of the emails for the client matter). The number of items in the Inbox should not be allowed to get too long – there should typically be between 5 and 20 messages in the Inbox at the end of each work day. Messages not needing any type of follow up can be instantly filed in the applicable folder, or simply deleted if the message is no longer needed. If action will be needed, but not within a few days, it is generally preferable to create a reminder in a formal reminder system / calendar and then move the email to the applicable client matter email folder i.e. use the Inbox as an informal reminder system for near term tasks and put reminders for longer term tasks into a formal reminder system / calendar. This prevents the Inbox becoming cluttered with emails relating to long term tasks. Be disciplined! If the list of items in the Inbox grows to more than 20 or so then the risk of overlooking items needing attention substantially increases and the system begins to break down. Still not convinced that using email folders make sense?! “I like to be able to keyword search my entire Inbox to find emails”. Apart from the fact that one normally knows the client matter the sought after email relates to and so it will be clear which subfolder to search, Search Folders (see separate guide on Search Folders) provide a complete response to this concern. Indeed, an “all mail” Search Folders will allow a single search to be done in the entire email account rather than having to do separate searches: one in Inbox and one in Sent Items. Click File (top left corner of Outlook). “Messages might be misfiled and I will not know where to search for them”. Search Folders provide a complete response to this concern. See separate guide on Search Folders. “I don’t need to use by Inbox as a reminder system because I flag messages needing future attention, or I mark them as unread after reading them”. The effort required to flag, and then later un-flag, emails (or mark them unread) matches or exceeds the effort in just leaving them un-flagged in the Inbox and moving them to the client matter folder when attended to, and applying the rule (discussed above) that if it is still in the Inbox it still needs attention. Flagging and categorizing are useful tools, and should be used, but do not alone provide the various benefits that arise from having all emails for each client matter saved to a dedicated folder and using the Inbox as an informal to-do list as discussed above.